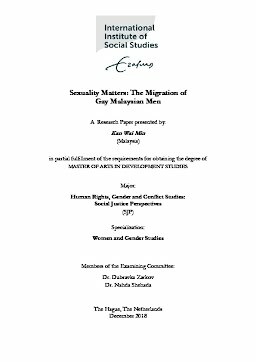 Based on in-depth semi-structured interviews with ten gay Malaysian men who have migrated to the Netherlands and/or the UK, this paper aims to explore and analyse the factors contributing to their migration, their expectations for migration, and their lived experiences as gay Asian migrants in the Netherlands and/or the UK. In order to study their migration, I use the concept of sexual migration that refers to international relocation that is fully or partially influenced by one’s sexuality (Carrillo 2004: 59). I investigate the particular circumstances and factors contributing to their international migration, relating these factors to Galtung’s conceptualization of violence that is not limited to physical violence. In that regard, I am attempting to make visible and demonstrate the broader and more nuanced violence experienced by gay Malaysian men in - and even out of - Malaysia. Next, I discuss participants’ lived experiences as gay Asian migrants in the Netherlands and/or the UK, and also consider their personal reflections on migration as a way of offering a more complete account of their migration, as well as to emphasize the importance of sexuality in relation to migration. Using an intersectional approach, this research also considers the ways in which participants’ lived experiences have been shaped not only by intersections of oppression, but also that of privilege.